What I do, is find the exact drivers needed for my WinPE environment to work on the specific model(s), and add only those drivers.. If I Can boot WinPE, and gain access to the network (IPCONFIG) and hard disk (DISKPART – list disk), I do not update my boot image, even if I choose to add a new NIC to the deployed OS itself! In this example I will use a DELL latitude E6320, because this particular machine has a network driver not already included in WinPE. The first thing to do is go into the device manager and check which driver the network card is using. I usually do this from the Win7 preloaded OS that comes with the machine (you know! before reinstalling). If this is not an option, you can do something similar from within WinPE using DrvLoad.exe, and wmic, but more about that in a later post!! As you can se from the picture, the Network adaptor is using an Intel® 82579LM Gigabit Network Connection driver. Now the driver must be imported into ConfigMgr. 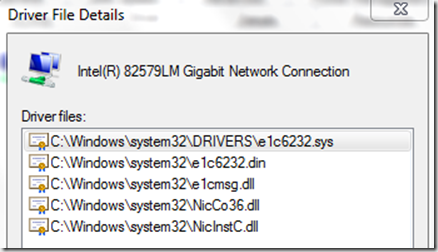 Normally I would import all the NIC drivers, and the look for the same info from within ConfigMgr. Do an import only, no need to add to category, package or Boot Image, at this point. Once imported your NIC drivers will look something like this. 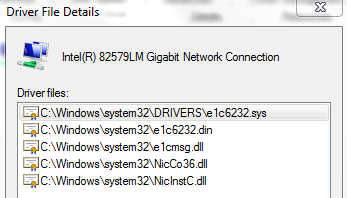 You can see that this particular driver works on Windows 7 x86 SP1, and that it also supports Intel® 82579V Gigabit Network Connection. The info corresponds to that found in the running OS, so it’s clearly the driver needed in the Boot image. Finally all there is left to do is inject and update DP, and the boot image should work like a charm. Excellent post, I constantly discuss this same issue with clients all the time. I’ve taken to getting all the drivers working as you state, then using DriverMax and exporting everything that isn’t a default windows driver, then importing them into SCCM, adding the NIC and Storage drivers only if needed. Saved much time at a recent client with 41 different laptop / desktop models to re-image. The day before I saw your article I worked out a method of using the VEN & DEV ID to find the right drivers. But, back in the old days, when using modems, there where always a generic driver for the modem. Made it possilbe to have a connection, not the best speed, but a connection. 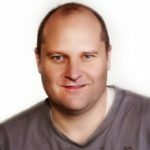 Why do not all the vendors, support for a generic NIC driver(10MB/s, full duplex) Ee all wouldnt hassel anymore with all the drivers in the WinPE? 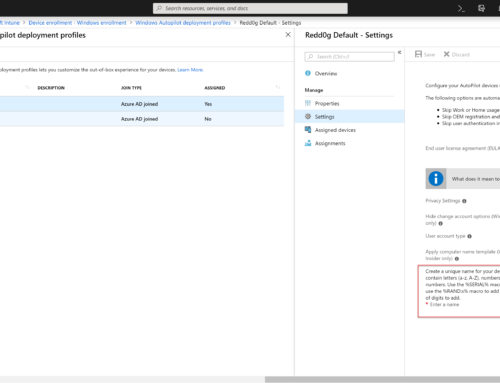 Since many vendors, do have the support within the WinPE, but some dont. How do you determine what Windows PE your enviornment currently is? Greetings! I’ve Been Following Your Website For A Long Time Now And Finally Got The Bravery To Go Ahead And Give You A Shout Out From Austin Texas! Just Wanted To Mention Keep Up The Good Job! it’s not too much for you, also your diet. your computer or removing your SD card and using an adapter to copy or move items. Thank you .. but, how does one go about accessing an Micro SD Drive from WinPE when the SD drivers are generic Microsoft ones but are not loaded by WinPE?